Newcastle interim manager Joe Kinnear has slammed "scandalous lies" in the press about a training session. Several newspapers claimed he turned up to take training on Monday to find there were no players there, when in fact no training had been scheduled. Kinnear launched a furious attack on the media in a news conference on Thursday, swearing 52 times. And he later told BBC Radio 5 Live: "I am sending this to my lawyers. There's not even one ounce of truth in it." He added: "I don't mind what they say if it's true but they are scandalous lies and I want to know why they want to do that." Kinnear earlier told the news conference that he would not be intimidated by the negative press surrounding his appointment. "I will stand up and fight for myself in any corner," he said. "You're not going to frighten me in any manner. "Whatever you do, or whatever headlines you run, you're not going to embarrass me. "I'm not going to stand for it. I've come up here for a simple chance to prove myself. Get off my back and let me get on with my job. That's all I ask." Kinnear, who takes charge of the Magpies for the first time against Everton on Sunday, is not expected to be at St James' Park for long, with a South African consortium keen to buy the club and possibly reinstate Kevin Keegan as manager. A Nigerian consortium also revealed they would seek to bring Keegan back if they were to take over. "I am contracted for eight games but I assume that, should due diligence and the deals go on a little bit longer, it may run into 10 or 12 games," said Kinnear. 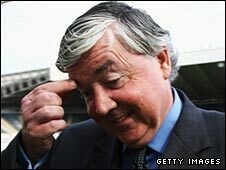 Kinnear has spoken with managing director Derek Llambias about the latest news on a takeover and passed that information on to club captain Michael Owen. "I have had a long chat with Michael Owen and he told me that one of the problems with the players has been that they have been kept in the dark as to what is happening. "Now after talking at length to Derek Llambias, I have been able to have a clear-the-air-talk with Michael in his role as skipper, and this has been passed on to the rest of the players. "They are now up to date with what is going on and they are a lot happier." Kinnear will not be allowed to sit in the dugout at Goodison Park this weekend as he completes a two-match ban dating back to his time as Nottingham Forest boss in 2004.